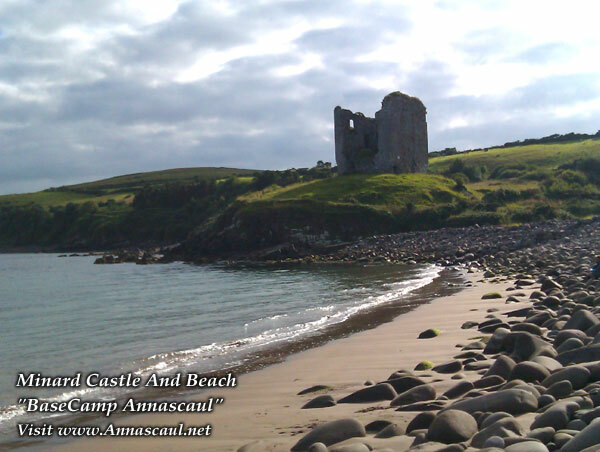 Minard Castle And Beach – BaseCamp Annascaul – Annascaul Village, Annascaul Accommodation, Tom Crean, Jerome Conor, Irish Horse Fair and more! 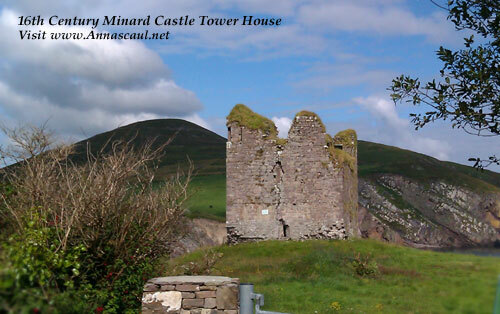 Minard Castle and beach is about 15minutes drive from Annascaul Village, or if you are walking it should take just under 2 hours at a reasonable pace. 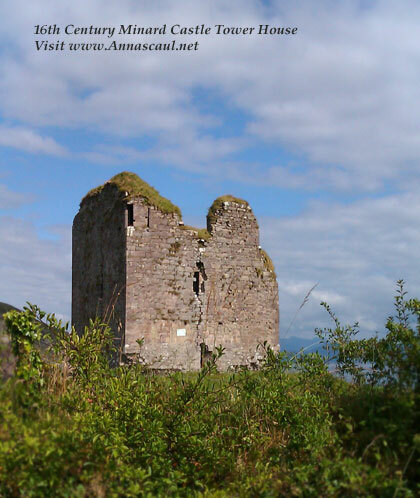 It’s perfect for a day-trip from the village and goes in our ‘BascCamp Annascaul’ list of recommended outings. 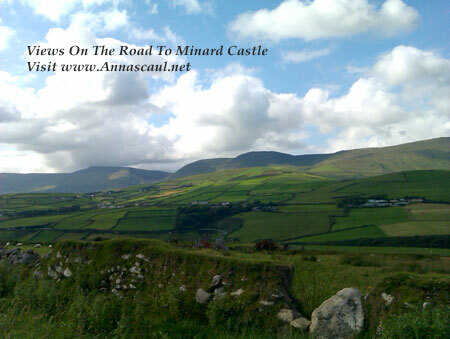 To reach Minard from Annascaul, head out of the village in the Dingle direction (south-west) and take the first left where you see the sign post for Inch. 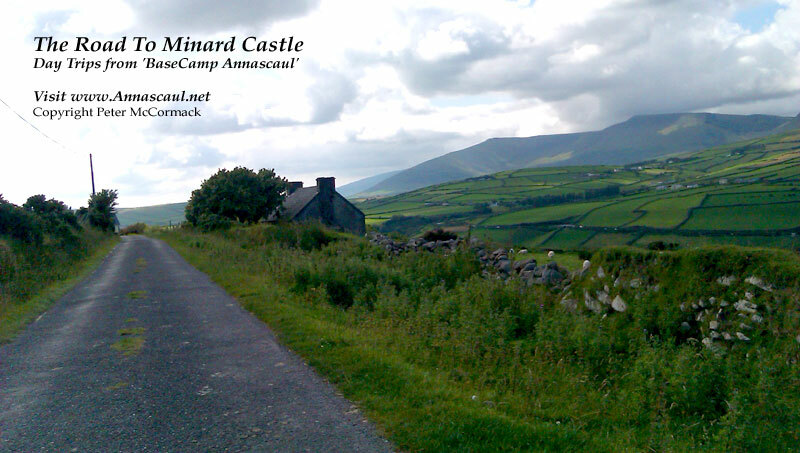 In about 450 m take the right off this road, and just follow the road which will lead to you Minard Castle, a 16th century tower house. 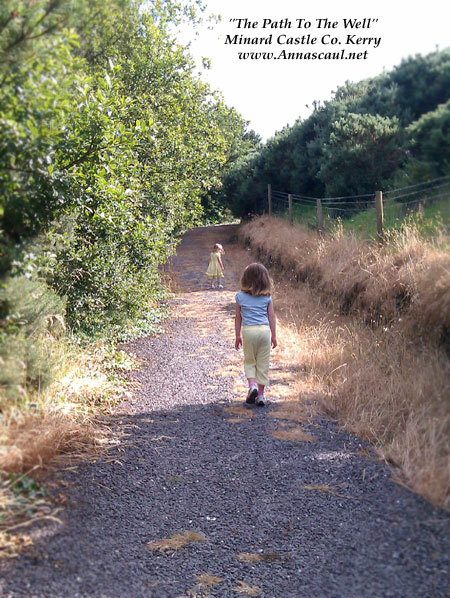 This is a nice road for walking, there’s little traffic and stunning scenery along the length of the road. 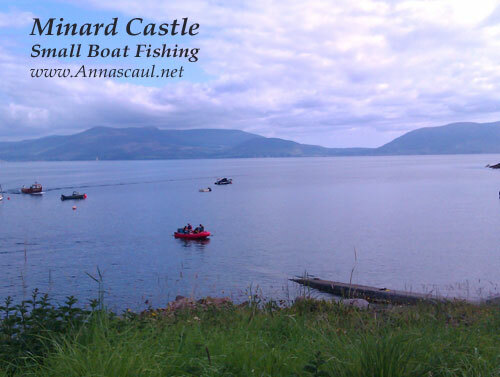 "The Road To Minard Castle Is Perfect For Walkers As There Is Little Traffic And the Sights Are Stunning"
As you approach Minard you’ll see the ruins of the castle. You’ll notice as you study the castle that the base corners are missing. The castle was a stronghold for the Knights Of Kerry (http://en.wikipedia.org/wiki/Knight_of_Kerry). 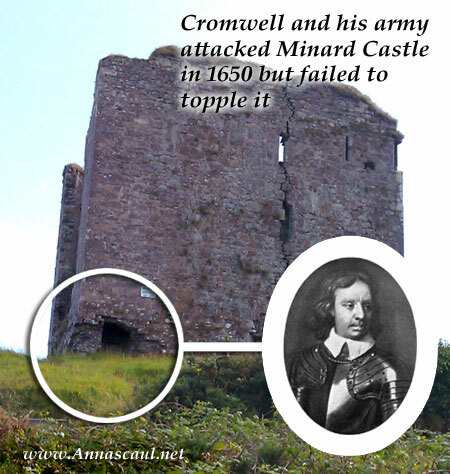 They drew some unwanted attention to themselves, and the castle was later attacked by the English Cromwell army in 1650 and structurally damaged. 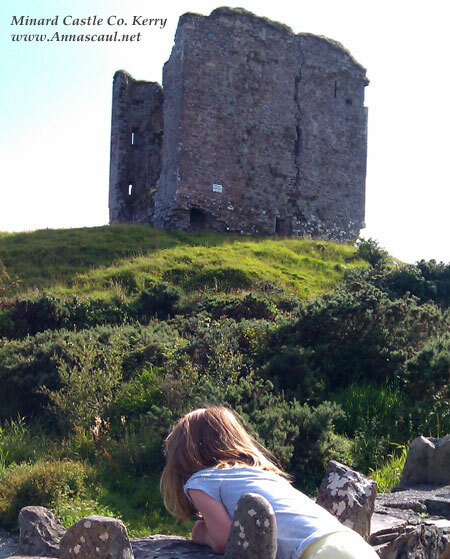 Fortunately the castle was well built and did not topple when the charges were detonated at each of it’s corners. However, the damage done was sufficient enough to make the building inhabitable. 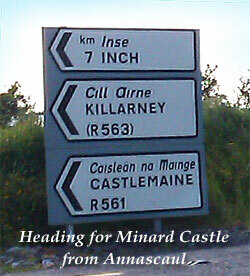 While we know this as Minard the area is actually called Min Aird Castle or in Gaelic Caisleán na Mine Airde. The Cill Mhuire Sandstone boulders along the beach have been rounded by the waves knocking them off each other over countless aeons. 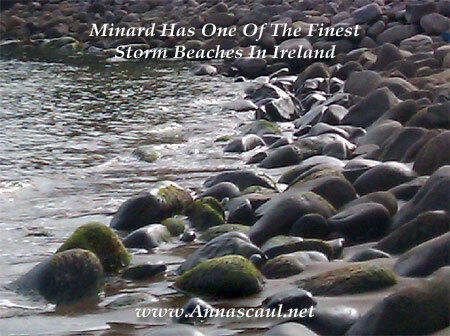 They were thrown along the stretch of beach by the sea, creating what is one of the finest storm beaches in Ireland. The act as a natural barrier preventing erosion and flooding of the fields just inshore. 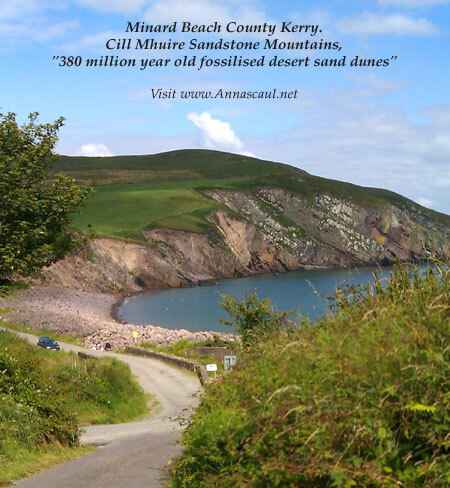 The cliffs of Minard are also of great geological interest as they consist of 380 million year old fossilised desert sand dunes that make up the yellow coloured stone in the Cill Mhuire Sandstone. When the tide is out this is great beach for paddling and swimming. The water is generally calm and there are no major currents to be concerned with. In fact, generations of local children have attended organised swimming lessons at Minard because it is usually very calm water with a gradually sloped beach. There’s a little bridge at the foot of the castle’s ground, and this is also good for children paddling. Often my own kids have happily played in the river (as I did myself when I was a child) while waiting for the tide to go out at the beach. Minard has a couple of hidden gems besides the castle and beach. 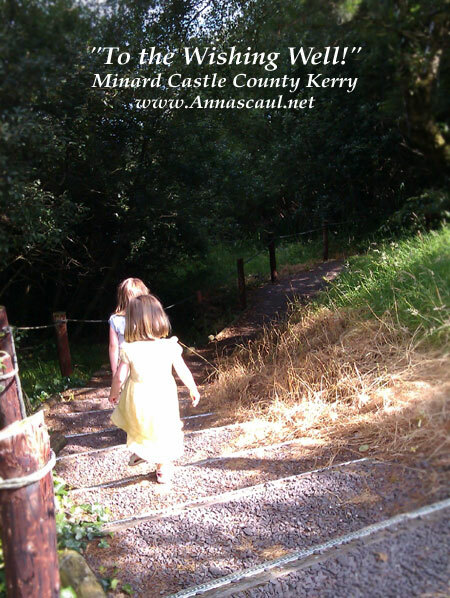 Continue walking up the high road around the castle and you’ll come to a gateway trail that leads to a wishing well or holy well. 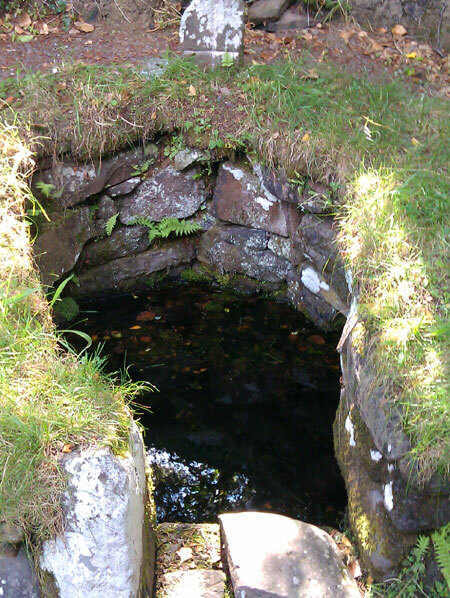 The well probably precedes Christianity in Ireland and may be a pagan site. Alternatively, it might just have been a source of drinking water and had no religious significance. This is a nice hideaway and a great place to visit. As you leave the well you can turn to the right and continue on for a minute where you come to an umer. This is regularly used by local fishermen, and sometimes tourists can book a fishing trip that leaves from this spot. I went on a couple of fishing trips from this site and caught more than my fair share of mackerel and pollock. Often you’ll see dolphins a little further out which is always a thrill. 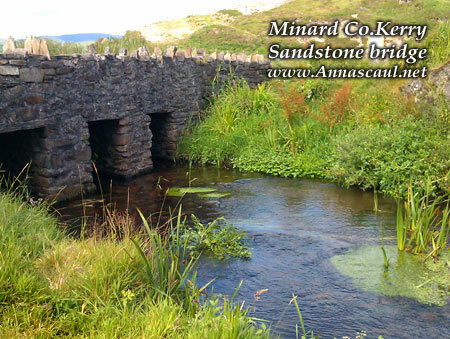 Minard is perfect for a day-trip from BaseCamp Annascaul, either for the walk or for a family day on the beach. As you can see it’s an area of geological interest that is also steeped in a rich history. 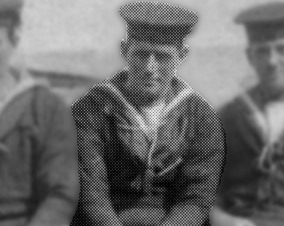 As a side-note, this is the beach the young Tom Crean came to and joined the British Navy, thus starting a career that would eventually lead him to his heroic adventures and explorations in the frozen Antarctic. Bring a picnic, a camera and your imagination. I’d say a small fortune has been lost between the rocks on the beach, so zip up any change and valuables so they don’t fall from your pocket and become part of the beach itself for eternity. I hope you visit and enjoy this amazing area only 15 minutes drive from Annacaul Village. This entry was posted on August 5, 2011 at 4:55 pm. You can follow any responses to this entry through the RSS 2.0 feed. Both comments and pings are currently closed.